A BRAND YOU CAN TRUST - STRATFIELD HOME DESIGN is dedicated to bringing high quality products, with a chic and urban aesthetic, to our discerning customers. A Beautiful Addition to Your Home, Or A Great Gift Idea! Our copper plant pots are designed with the discerning consumer in mind. Made of high quality stainless steel, with feature copper finish, the luxe feel of these planters will shine through. Highly presentable, and great in photos, these planters make an impact. We believe that a gift is more than a symbol of ones affection, it is a statement that will be remembered for years to come. These succulent planter pots, along with their sturdy packaging ensuring no breakage during transportation, make an easy gift idea. Succulent and gardening connoisseurs and casual plant lovers alike will appreciate the quality and design of these pots. - Absolutely love the products or your money back, guaranteed. We are committed to making our customers happy. Click on the Add To Cart button now to order today RISK FREE! ✓ SET OF THREE POTS - Perfect for showing off collections of succulents, herbs, cactus plants or home decor. 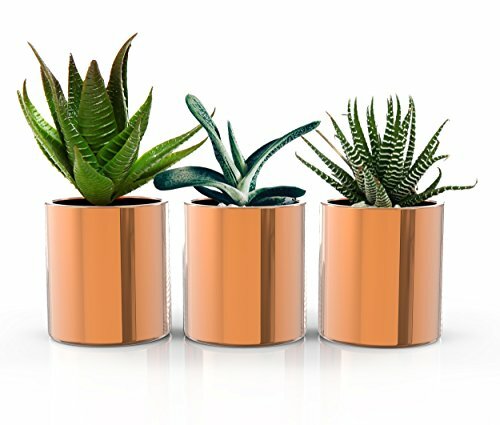 This set of three copper modernistic planters for displaying around your home are perfect for the living area, terrace, balcony, window sill, or office space. ✓ COPPER IS A TOP TREND of 2018 - Customers can't get enough of copper home accessories. These copper succulent pots are sure to impress your family and friends alike. Great for mixing and matching with other copper accents and accessories you may already have in your stylish home. ✓ SATISFACTION GUARANTEED - We are so confident you're going to love our Succulent pots, we're offering it with a 100% refund guarantee. ✓ A BRAND YOU CAN TRUST - STRATFIELD HOME DESIGN is dedicated to bringing high quality products, with a chic and urban aesthetic, to our discerning customers. If you have any questions about this product by STRATFIELD HOME DESIGN, contact us by completing and submitting the form below. If you are looking for a specif part number, please include it with your message.